This show was broadcast on December 18, 2012. “Jewish superiority” – or ethnic networking? __ Let’s ask Prof. Kevin MacDonald! Excuse us for noticing, but Jews (i.e. people who would be considered automatic citizens of Israel) are wildly over-represented in American society’s most desirable, powerful and privileged positions. Of the 100 richest Americans, somewhere in the neighborhood of 30% to 50% are Jewish – not bad for a group that makes up less than 2% of the population! Jews completely dominate Hollywood and the media, contribute close to half of the bribes (I mean “campaign contributions”) in federal elections, make up about one-third of the Supreme Court, and dominate banking and finance. And so on and so forth. In other words, just as certain ethnic groups colonize certain neighborhoods in American cities – they “just feel comfortable” living near each other – so Jews have colonized the most powerful and privileged positions in American society. Today’s radio guest Kevin MacDonald, Professor of Psychology at California State University – Long Beach, has done extensive empirical research on this topic. His conclusion: Though Jewish IQs are slightly higher, on the average, than non-Jewish IQs, the rather stunning over-representation of Jews at America’s elite universities, and other positions of power and privilege, cannot be explained by ability or intelligence. 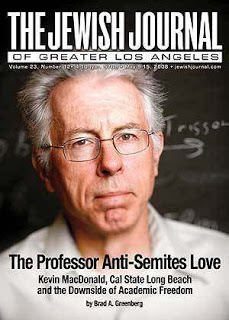 Kevin MacDonald has (predictably) been vilified for his politically-incorrect research. Vilification is so much easier than rational-empirical refutation. 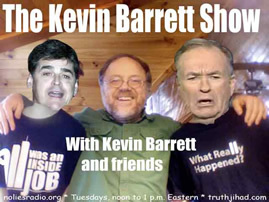 This entry was posted on Tuesday, December 18th, 2012 at 9:44 am	and is filed under Disaster Capitalism, Econo, Freedom, Justice, Kevin Barrett, Mind Control, News, Occupation, Protest. You can follow any responses to this entry through the RSS 2.0 feed.